At some unknown time prior to 1904 Athabascan Indians inhabited portions of Alaska’s vast Interior region. Moose, caribou and sheep were abundant close to the rivers and in the Granite Mountains. 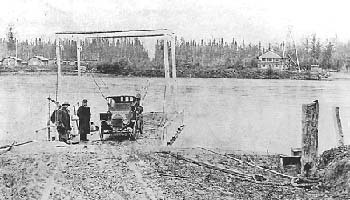 Fur-hearing animals were easily trapped and salmon came up the Delta and Tanana Rivers to spawn. Wild berries grew in the surrounding countryside. Numerous archaeological sites point to habitation by the Indians 10,000 years ago. Roadhouses were built along the trail north and one, Bates Landing, was situated at the confluence of the Delta and Tanana Rivers. It was at this point that travelers had to cross the Tanana by a ferry. The Federal Government collected a toll on the southern side of the river from all passengers heading north. In 1906, John Hajdukovich bought the roadhouse and enlarged it. He operated the lodge, had a steamship plying the Tanana, traded with the Indians for furs and took hunting parties into the Granites. Rika Wallen, who had come from Sweden as an 18-year-old girl, was at Tonsina and walked to Big Delta to go to work for John. He was away a great part of the time and finally owed Rika so much in back wages that he deeded the property over to her. She also had an adjoining homestead. Rika’s Roadhouse, on the National Register of Historic Places, is now the focal point of Big Delta State Historical Park. In 1939, Mary Hansen and her late husband, Bert, came by bus from Fairbanks to take over a homestead on the north bank of the Tanana and to operate a roadhouse and guide service. Mrs. Hansen now lives in Wasilla; her daughter, Irene Mead, the first white baby born here, still resides in the Delta area. Some old maps refer to Delta as Buffalo Center. This name was used because of the bison herd which was introduced in 1928 and still ranges free in the area. 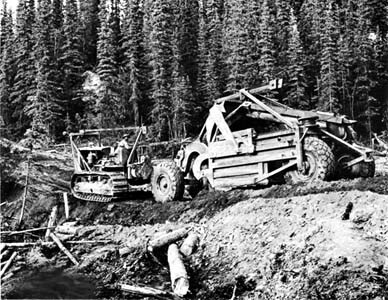 The building of the Alaska Highway in 1942 brought more development. A trail was cut into the Clearwater Creek country for access to fishing and as a fire break. People began homesteading in the area along the creek and the highway. Allen Army Airbase (now Fort Greely) was among the series of airfields constructed along the Alaska Highway during World War II. The field did not see much use after 1948, the Army started its Arctic Training Center (now known as the Northern Warfare Training Center) and civil service workers began to settle in the area as the army post grew and offered more employment. The population center, which had grown around commerce at the two rivers, began to move to the junction of the two highways and nearer the present army post, on which construction started in the early 50s. By 1953, Delta had 13 bars and three service stations, catering to the needs of construction workers and men stationed at the post. Tourism began in mid century and continues to increase. Gradual growth has continued in the ensuing years. Construction of the trans Alaska pipeline created a temporary ‘boom’ economy but, with completion of that mammoth project, community life returned to normalcy.